Leevi came to our pack in 2012. Leevi has born 17.7.2012 at kennel Utamuutin. Calling name Leevi was his "born name" and did fit for him so well, that we decided to make exeption in our native indian names and keep him named Leevi. Leevi's parents are FI CH Cahppes Knight Of Naxxar REK1 KVK1 "Talut" and FI CH NO CH Silverdream's Heart Melody REK1 KVK1 WTD "Awa". Talut is our Yona's brother and he did run in our team during couple winter. 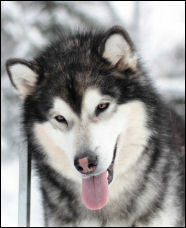 He is very nice malamute, both of his temperament and his appearance and structure. And Talut is good worker too. I have always liked Awa, she is very beautiful female, imported from Canada and her earlier offsprings have been very nice too. When I heard about this breeding, I couldn't help myself from interest to take puppy from this combination. Well, when we saw first photos of Leevi, we were in love! And now, we have Leevi in our pack. Leevi is in co-ownership with his breeder, Sari Kinnunen, who owns 1/3 of him. Leevi is happy, determined and extremely energetic. 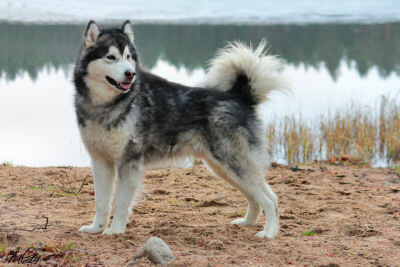 If you can tell something about his parents, I think there is jumps, flying and voice coming out of him... :) Leevi has shown to be good working malamute, and usually runs in lead, earlier with Yona and nowadays with Vilkku or his daughter Weeko. 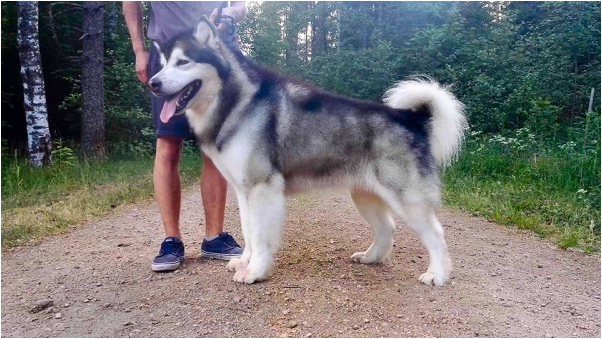 Leevi has working title, KVK1 from Alaskan Malamute's official Weight Pull test from winter 2015. Leevi has also EK3-resuls from year 2016 Ruunaa Race (Finnish Championship Race in MD4-class), distance was 3 x 32,5 km = 97,5 km. He has also ran Eastpoint Open 100 km (diminished to 75 km because trail conditions) race in Feb 2016, in 6-dog team. Leevi has 2 litter, one in Estonia with Hellerkantri Himma (Kennel Karusaare, breeder Heinrich Lukk, 9 puppies) and one in Finland with Zadun Kiss Of Fate (Kennel Ataciara, breeder Reetta Majalainen, 7 puppies). We have Leevi's daughter Weeko living with us and also another daughter, Siiri is living in Finland.